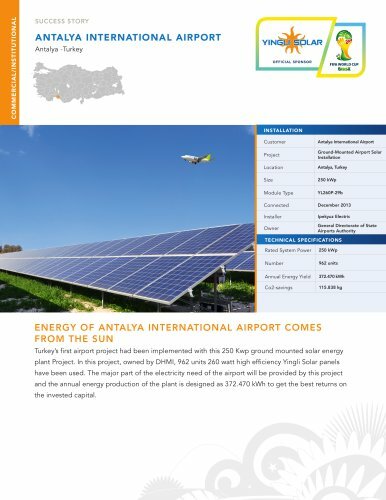 SUCCESS STORY ANTALYA INTERNATIONAL AIRPORT Antalya -Turkey INSTALLATION Customer Antalya International Airport Ground-Mounted Airport Solar Installation Antalya, Turkey Module Type Ipekyuz Electric General Directorate of State Airports Authority TECHNICAL SPECIFICATIONS Rated System Power Annual Energy Yield ENERGY OF ANTALYA INTERNATIONAL AIRPORT COMES FROM THE SUN Turkey’s first airport project had been implemented with this 250 Kwp ground mounted solar energy plant Project. In this project, owned by DHMI, 962 units 260 watt high efficiency Yingli Solar panels have been used. The major part of the electricity need of the airport will be provided by this project and the annual energy production of the plant is designed as 372.470 kWh to get the best returns on the invested capital.